There is no need for entering line endings, and up to date hyphenation rules are being used. Characters/words can be switched to bold/italic/underlined manually, or steered by the template. After the typing of text is ready, a preview can be asked, using several border styles. 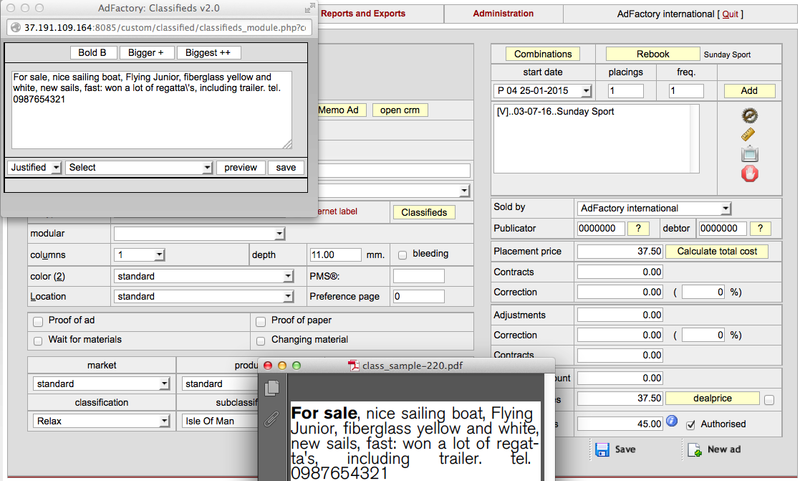 This shows the real print version of the created ad PDF, while the height is automatically calculated. The price can be based upon mm, number of words, or lines, and can immediately be communicated to the customer. After saving the ad, it is ready for placement in print or online; there’s no need to do additional work on it, and therefore this module saves a lot of time in the production department.